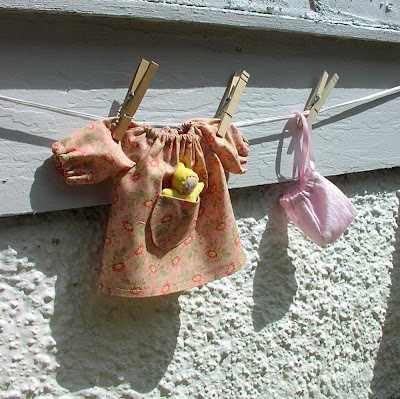 I wrote an article on Waldorf doll care on my blog previously. You can read it here. But since many people who own natural dolls may have these questions I wanted to make a renewed effort at giving directions for cleaning your doll babies and clothing. Question #1: Can I wash my doll? If you are the proud owner of a natural Waldorf style doll, no matter who the maker is, your doll should be stuffed with sheep's wool. If you are not sure about your doll's stuffing you should ask the maker to be absolutely certain of it. My dolls are ALL stuffed with clean carded wool. Being stuffed with real wool is of great advantage! Not only does the wool give warmth and softness, these benefits aside, sheep's wool has natural antibactirial properties. Wool is less likely to pick up germs and dust to begin with. Wool stuffing means your doll is washable and that it is okay to fully soak your baby in water and give her/him a complete bath! make sure the water is lukewarm and NOT hot. Just as giving a bath to a sweet babe. Don't use harsh detergents or cleaning agents. Best is a product you would use for a wool sweater such Woolite or a gentle shampoo. You may even want to give your doll and your child a bath at the same time. Just make sure that the soap used at bathtime is colorless and a mild one. You can apply mild soap directly to a bad spot and gently massage that area. Then rinse out the doll until all the soap suds are gone. After the bath you must gently squeeze the dolls' limbs and mid-section to get most of the water out. Don't sqeeze the head! Since it is formed and shaped with string it should not be squeezed or treated too roughly! Too much squeezing might damage the shape of it. Question # 2. What about haircare? 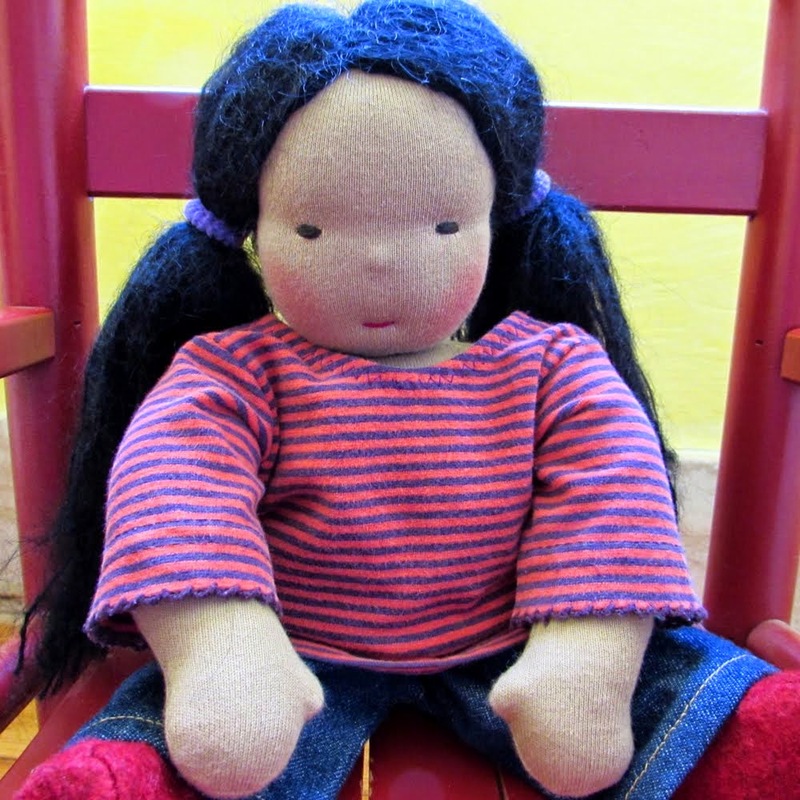 Can my child brush the dolls' hair? A Waldorf dolls' hair is usually made of worsted wool, mohair yarns, or combinations theiroff. Sometimes dollmakers use the loopy curly kind known as boucle yarn. You should NEVER EVER brush your doll's hair with a real hairbrush. It should only be styled using fingers. Rough brushing of the hair will thin the hair out or destroy the loops of the mohair. Maybe this has already happened to your dolls' precious tresses. Don't get too upset. It is fixable! 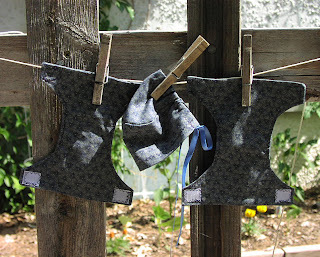 The great thing about Waldorf dolls is that you can repair them! Dollmamkers use varying techniques to sew on dollhair. It kind of depends on the make of your doll. My dolls usually have a crocheted wig. If the doll has long hair the hair is sewn onto this wig. If the hair is damaged you can remove the layers of damaged hair and sew on a new layer. Just search for the tiny stitches and gently undo them. You could even get creative and give your doll a whole new look and different haircolor. I will write another article on this topic to help you out! So keep watching my blog! Question #3 What about the doll clothing? Can it be washed? I recommend hand washing all little doll clothes. Why? Because most US washing machines I have come across are quite violent and have ripped my own clothing - even when set on a gentle cycle - to shreds. If you absolutely don't have the time and energy you could put your dolls' clothes in a protective net and wash them on cold in a machine. 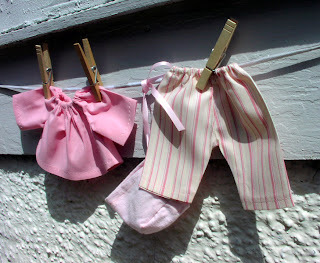 If the blush on your dolls' cheeks has faded, a wee bit of red beeswax crayon can be applied. If you don't own such a crayon you can use a non-toxic red pencil to gently rub some new blush on the cheeks. Don't overdo it though! But also don't be afraid. I believe the true beauty of these dolls lies in the fact that they can take some loving and still be adorable. But since natural dolls are made of cloth, small holes or tears can be fixed. Don't be afraid to take a needle to your doll! You may even find you enjoy it and decide to make a doll of your own! Please, let me know if you have any other questions about doll care. I'd be glad to share my kwowledge to help you keep your baby clean and pretty looking! If you are a dollmaker I would love to get some of your cleaning tips and suggestions, too! Bathtime for Bella is always a special event. We always wait for a good sunny day (or a bitterly cold one when the woodstove will be roaring) Then my daughter and I lay out an array of towels and soap as if we were washing a newborn. Bella is always so happy to be clean, and I am amazed at the magic of Waldorf dolls! Sweet! Now I need some pictures of dollies getting a bath! If you have some could you send them to me, please! I never like to wash things that are artistic. I always worry I will damage them. Even if they say you can. God Bless the Child who has his Own - Cellphone ?